Place diced ahi (tuna) in a medium size bowl, cover and refrigerate until ready to combine other ingredients. In a small saucepan over medium heat, add the soy sauce, sugar and mirin. Bring to a boil and reduce heat to low, add garlic, ginger and Thai chilies stir, let the sauce reduce and thicken, this will be approximately 3 to 5 minutes, stir sauce frequently. Remove from heat and allow the mixture to cool. Once cooled, pour into the bowl with the ahi (tuna) and gently combine the sauce with the fish. Add the sesame oil, green onions and ichimi togarashi mixing until completely combined. Allow the ahi (tuna) to sit in the refrigerator covered for one to two hours to allow the flavors to develop. 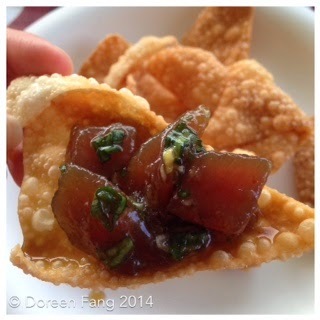 Serve poke chilled either by itself or with wonton chips. If serving during a party, keep the bowl over ice to keep the poke chilled. * Mirin is a Japanese sweet cooking wine. You can find this in all Asian markets and the Asian aisle of a supermarket. * Ichimi togarashi is a single dried chili pepper you can find at any Asian market.